In a pub on Queexox V, the Turtles are in the midst of a bar brawl. The Fugitoid apologizes for taking them to such a dive, but they’re more concerned with getting out. In the midst of the fight, Raph draws his sai back to attack without looking and accidentally spears the Fugitoid through the head. The Fugitoid goes offline and the Turtles rush to get him some help. At an Utrom lab, Dr. Oolric repairs all of the Fugitoid’s circuitry with fresh SAL-5000 worker droid parts. However, he fears that due to the Fugitoid’s unique origin there may be irreparable damage to his memory. Indeed, as the Fugitoid comes to, he proceeds to flicker in and out of moments throughout his life as Professor Honeycutt. Later, Donatello and the Fugitoid try to work out the problem. Donatello feels that the menta-wave helmet which transferred his mind into the SAL droid is the key to restoring his memory functions. Unfortunately, due to his malfunctioning, the Fugitoid can’t remember how he built the device. Thinking harder, he recalls how the helmet he was wearing was just a prototype which lacked a very crucial component: The component necessary to actually transfer information from one unit to another. Without that component having been installed, the Fugitoid realizes that the helmet merely sent a copy of Professor Honeycutt’s memories into the SAL droid. That means that the real Honeycutt died all those years ago and the Fugitoid has never been anything more than a robot programmed with the Professor’s memories. Naturally, the Fugitoid becomes very distressed, but Don tells him not to jump to any conclusions until they’ve had a chance to look at the menta-wave blueprints. Raph suggests they go back to Honeycutt’s old lab on D’Hoonib (which is in Federation territory), as it likely hasn’t been touched since he abandoned it. Donnie and Raph decide to go with the Fugitoid to keep him safe, as he’s still wanted by the Federation military, while Leo and Mike stay behind to keep the motor running on their getaway. Arriving at the lab, Raph and Don wait outside while the Fugitoid gets to work. The moment they entered the building they set off an alarm and the Federats dispatched a unit of soldiers to collect them. Raph, feeling guilty for having caused all of the Fugitoid’s troubles, promises to fight off as many Federats as it takes until the Fugitoid finds what he needs. The Federats arrive and the Turtles proceed to pick them off one at a time as they move through the forest. Inside the lab, the Fugitoid finds his burnt out menta-wave helmet and repairs it. He claims that it is attuned to the mind of Professor Honeycutt and if he isn’t truly the Professor, then the helmet won’t respond to him. Putting it on, his memories proceed to go crazy, taking him to different points throughout his life (including a time when he was a child and walked in on two Utroms discussing whether or not the Federation was ready for First Contact). This brings him great pain and, throwing down the helmet, he runs into the forest. Collapsing from the pain, the Fugitoid decides that since he’s just a machine, he’d be better off pulling out his circuitry and ending himself. Before he can, one of the Varlesh (the crab people) approaches him. It’s the same Varlesh who saved him from General Blanque and the Federats years ago, and as his friend, he wants to know what troubles him. The Fugitoid, recalling that the Varlesh are psychic, asks if he can determine whether he’s the true Honeycutt. The Varlesh is confused by the question, as the fact that Honeycutt and he are talking is proof that he’s truly Honeycutt. Fugitoid explains the situation, that just because he has Honeycutt’s memories, it doesn’t mean that he’s Honeycutt, as Honeycutt’s body died long ago. The Varlesh suggests that if a person were to cut off their hand, the hand would cease to be that person, but the person would remain. The same with the leg and any other extremity or organ… including the brain. The Varlesh says that even if Honeycutt’s body and brain were destroyed, so long as his mind and memories survive, then the Fugitoid is Honeycutt. Taking comfort in this, the Fugitoid thanks his old friend and departs. As he leaves, the Varlesh remarks that the Fugitoid has “a kindly soul”. *This story takes place during the six month gap in TMNT(Vol. 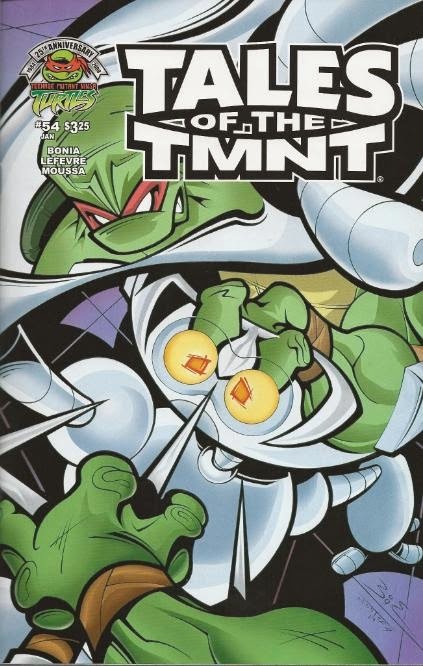 4) #5 when the Turtles were hanging out with the Utroms and the Fugitoid. 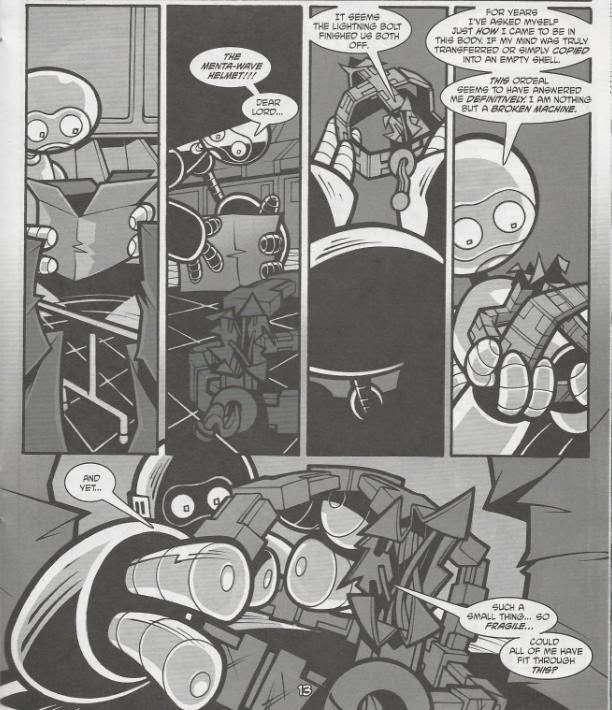 *Professor Honeycutt had his brain swapped with the SAL5000 droid way back in Fugitoid (microseries) #1. He met the Varlesh (the crab person) in that same story. *Among the Fugitoid’s memories are when he first met the Turtles, which occurred in TMNT (Vol. 1) #5. *The menta-wave technology which the Fugitoid rediscovered in this issue will eventually be hijacked for unsavory purposes by the Utroms in the story “The Grape”. *While it may seem strange that after all these years the Federats are still after the Fugitoid, it remains consistent with stories set in the future. The Federats will still be chasing the Fugitoid in Gizmo and the Fugitoid #1. *Dr. Oolric says that the Fugitoid inhabits the body of a SAL-5000 model droid. In Gizmo and the Fugitoid #1, it was described as the SAL-400 model. 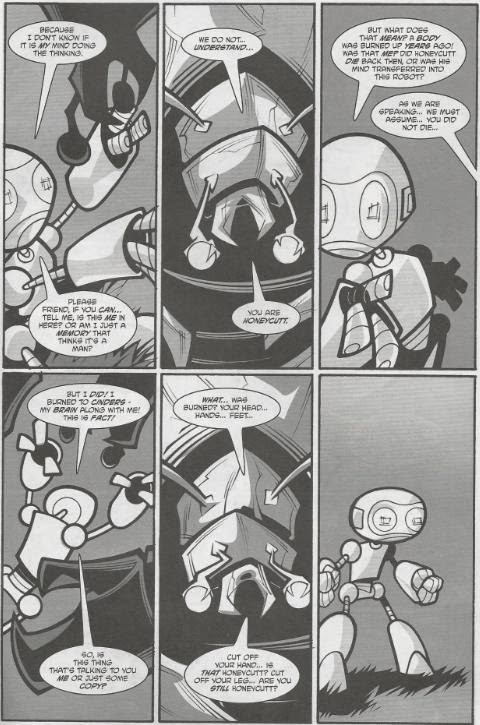 The Fugitoid doesn’t get a lot of spotlighting stories, which is funny, considering he was conceived by Eastman and Laird as a solo character and only folded into the TMNT universe after the fact when his back-up strips floundered. It’s true that the Fugitoid does work best as a supporting character and not a star act, but it’s nice for him to get the focus every now and again. Author Andrew Bonia conceives of a plot that calls way back to the Fugitoid’s first appearance and is a sequel to that original arc in a way. If anything, it ties up a potential loose end you may or may not have thought about. Sci-fi technology is funny in that, being science and all, it doesn’t really take into account spiritual concepts like the “soul” or what have you. We sort of project that onto the technology ourselves and often do so without really giving it a conscious thought. Every time Captain Kirk steps into that teleporter and gets disintegrated, we just assume that the Captain Kirk that gets reintegrated on the other end is the same guy; we just assume his singular one-of-a-kind consciousness, be it a “soul” or something else, get’s sent across time and space with him. But when the teleporter is just destroying one form and then making a copy of it at a distant location with the data it collected, that’s not the REAL Captain Kirk, is it? It’s just a copy or a clone that THINKS it’s the real Captain Kirk. And the same idea translates to the Fugitoid (or the Justice League, or Seth Brundle, etc.). His “mind” was transferred from Honeycutt’s body and into SAL’s, but when we think of the “mind” do we mean his consciousness or just his memories? That’s the big dilemma Fugitoid is wrestling with in this issue, and while it isn’t an entirely fresh concept for the medium (LOTS of sci-fi comics and TV shows have tackled this situation), it’s definitely one worth addressing so far as the Fugitoid is concerned. It’s interesting to see how frustrating this whole situation is for the Fugitoid, as he can’t quantify something as intangible as the mind and struggles to come up with some sort of way to “prove” that his mind is the real deal and not just copied memories. In the end, he accepts that there’s no scientific way to prove such a concept and instead takes comfort in the Varlesh’s more philosophical approach. And while the Varlesh does come as a late addition to the story, he isn’t necessarily used as an easy-out, either. The Fugitoid wants him to use his psychic powers to conveniently answer his query, but the Varlesh takes it in a different direction and doesn’t act quite so much like a magic MacGuffin. The IDW TMNT comic would tackle this same concept, as that book deals with reincarnation and spiritualism in addition to intergalactic teleportation. It doesn’t broach the subject quite as thoroughly as this comic, which is probably for the best, as if every single story that uses teleportation felt required to cover this same old song and dance, audiences would demand the technology be retired simply out of boredom and irritation. Bob LeFevre’s art is chaotic, but befitting of the subject matter. The visuals are constantly fluctuating between the present and the past and the Fugitoid shifts between memories, so the off-kilter and surreal effect gets the tone across. I don’t much care for his Turtles and their massive egg-headed craniums, and he sometimes makes their expressions so manic that they don’t accurately reflect the tone of their dialogue (see the sneering, loony-looking Leo at the bottom panel of Page 3 as he says, “We don’t have time, Mikey, we need an exit now!”). Still, it’s a unique-looking issue amongst the Tales catalog and the take mostly fit the story it was trying to tell. It was nice to catch up with the Fugitoid on a more intimate level, as he’s mostly just been a hanger on or a background personality since his return in TMNT Volume 4. While I do think he’s better as a supporting character, even supporting characters need their moment in the sun every now and again.